Ithaca, NY, Oct. 18, 2016 – Ithaca Fantastik will unleash its fifth annual film festival Nov. 9–13 in Ithaca, NY. The IF team has carefully crafted a lineup to offer something for every fantastic film lover. The festival has horror fans covered, with some of the year’s stand-out genre gems. Fantastic Fest award winner “The Autopsy of Jane Doe” (André Orvedal) will lead the pack, followed closely by the ‘knock your socks-off’, “Safe Neighborhood” (Chris Peckover)—a coming of age twist on home invasion that the IF team calls one of the most fun films of 2016. Horror lovers will be delighted by action-packed “Headshot” (Kimo Stamboel, Timo Tjahjanto), socially-infused zombie anime “Seoul Station” (Yeon Sang-ho), disturbing “Pet” (Carles Torrens), as well as an over-the-top Indian take on a zombie breakout: “Miruthan” (Shakti Soundar Rajan). Extreme horror will be well-represented with yakuza tale “Kiyamachi Daruma” (Hideo Sakaki), and “K-Shop” (Dan Pringle), a fun horror film with deeply-anchored social commentary on British society. Plus, the wickedly fun Japanese response to Freddy vs Jason: “Sadako vs Kayako” (Kōji Shiraishi). Festival offerings will go far beyond pure horror to provide a wide view into the fantastic genre. From enchanting love story “Aloys” (Tobias Nölle), to mental-illness-exploring biopic “I, Olga Hepnarová” (Tomás Weinreb, Petr Kazda), to mumblecore horror comedy “Another Evil” (Carson D. Mell) and Argentinean horror commentary “Terror 5” (Sebastian Rotstein, Federico Rotstein). Sci-Fi fans have not been forgotten; IF will present mind-blowing anime “Nova Seed” (Nick DiLiberto) and the newest trippy film from Hikaru Tsukuda: Return of MIZUNO—these movies will be an excellent segway into horror for those new to the genre. For its fifth year, IF will continue to bring the best in documentaries to upstate NY. “24x36: A Movie About Movie Posters” (Kevin Burke) will open the festivities. The reality continues with an intimate take on Stanley Kubrick: “S is for Stanley” (Alex Infascelli), as well as “Creature Designers: The Frankenstein Complex” (Gilles Penso, Alexandre Poncet)—an enlightening look at special effects history with interviews from masters like Phil Tippett, Rick Baker and Guillermo del Toro. Finally, with a perfect mix between feature film and documentary, “Belief: The Possession of Janet Moses” (David Stubbs) mind-blowingly blurs the lines between reality and fiction in this account of a New Zealand exorcism. For filmmakers, the Nature’s Revenge bumper contest submission deadline has been extended to Oct. 30. This year’s bumper contest will draw from the theme of retrospective film “Long Weekend,” which proves nothing is scarier than unpredictable nature. Filmmakers are invited to submit their own original nature revenge short film to IF by Oct. 30. Use wetransfer.com to submit to hbarbier@ithacafilmfestival.com. Type NATURE’S REVENGE IF in the message section. 2. The twist should involve nature taking revenge on humans for their acts against mother nature. The IF team can’t wait to see what the beautifully twisted minds of seasoned and aspiring filmmakers will come up with. 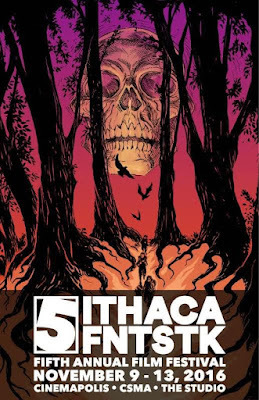 The top three entries will be screened during the festival, and winners will receive an Ithaca Fantastik festival pass. Visit ithacafilmfestival.com for more information and announcements to come about special guests and events. The Puppet Man (2016) Brooklyn Horror Festival.